Imagine a gigantic pitcher standing on Earth, ready to hurl a huge baseball. What will happen as the ball is thrown harder and harder? Find out with the Gravity Pitch Gizmo. Observe the path of the ball when it is thrown at different velocities. Throw the ball on different planets to see how each planet's gravity affects the ball. Observe that gravity causes objects to fall toward the center of Earth. Observe that when a ball is thrown, its path is bent by gravity toward Earth. Notice that when the ball is thrown with a high enough velocity, it will go into orbit around Earth. If it is thrown even harder, it will fly off into space. 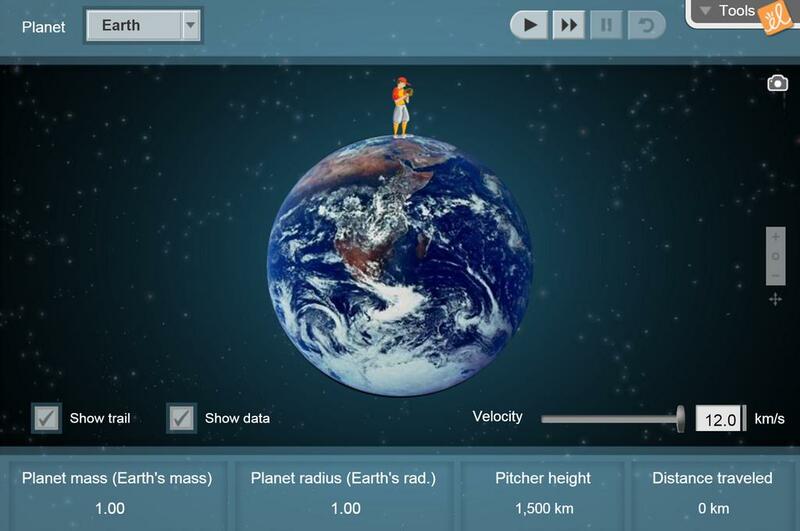 Find the orbital velocity and escape velocity of objects on Earth and other planets. Use controlled experiments to discover that gravity becomes stronger as a planet's mass increases and weaker as a planet's radius increases. My class really enjoyed this especially when you throw it far. Gravity Pitch is great for 6th grade students! Great gizmo to try and knock the guy out! I use this one to introduce the concept of orbits. Love it!